Atlanta, GA – August, 2015: Georgia’s state capitol was dubbed “Hotlanta” for its sizzling climate and all the whimsical attractions it has to offer. Among the latter, a multimillion dollar deal announced by Falcons Owner and Chairman, Arthur Blank, will welcome the Atlanta United FC professional soccer team and a state of the art complex to match. A telltale sign that a sport once ignored by the African American populace, is now in the know. But don’t tell the Southside Heat, the only competitive female African American teenage soccer team in the city, and yet another ‘sizzling’ asset to acknowledge. Members of the Southwest Atlanta’s Tiger Soccer Club, the Heat has risen to athletic prominence over the better part of a decade. 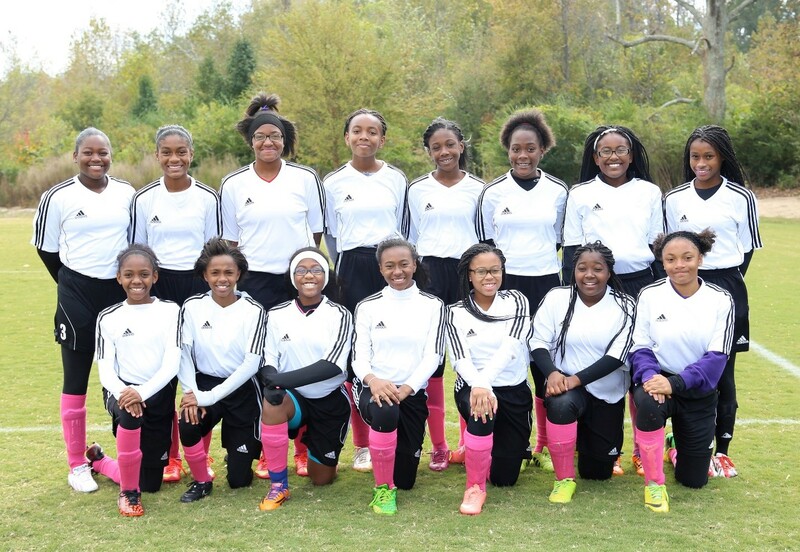 Ranked 39th in the state of Georgia and among the leaders in Athena U15 Competitive Soccer, it marches into fall season play after registering an undefeated 2014 fall campaign. While competitive clubs they routinely play against, and defeat, are oft times financially driven, the Heat’s focus is motivated by true passion. That, along with a longing desire to improve each and every time their cleats settle into the soil to engage another squad. Prior to the sudden popularity and interest in soccer, perhaps initiated by the 2015 US Women’s World Cup victory this summer, The Heat established itself as a tough, nose to the grind bunch with an undying passion for the game. Fred Spencer, whose daughter Simone Spencer (12) has been playing soccer since the age of four years old, decided on moving to join the Heat this season upon hearing of its stellar reputation. While the Heat has gained notoriety and acclaim for its on the field performance, its chemistry is something that was established before many of the girls were presented with their first homework assignment(s). Since joining the Tiger Soccer Club as a complete group after bolting from another less competitive organization, the Heat has essentially grown up together, as sisters. THE TALE OF TWO RECEIVERS: ONE GOING DEEP AND THE OTHER RUNNING FOR DAYLIGHT IN THE GAME CALLED LIFE! By Harold Bell! Hey Buddy!, I found this information for you: "AFRICAN AMERICAN TEENAGE GIRLS OPT FOR SOCCER". Here is the website link: https://blackmeninamerica.com/african-american-teenage-girls-opt-for-soccer/. Thank you.